Moradabad city in Western Uttar Pradesh, India was established by Mughals. In 1625, the Mughal Emperor Shahjahan appointed Rustam Khan to capture this place and he set up a fort there, named it Rustam Nagar. Later on, it named Moradabad after Shahjahan’s son Murad Baksh. Moradabad is famously known as “Peetal Nagri” or “the Brass City”. It is recognized for its high quality Brass Handicrafts that are exported all over the world. Moradabad is famous for its metal Art and acknowledged for its colored enameling & intricate engravings. Color & engraving patterns are very interesting and traditional. 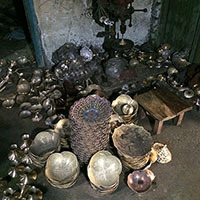 Various items created through Brass which includes traditional Vases, Trays, Stools, Decorative items and idols of Gods and Goddess. 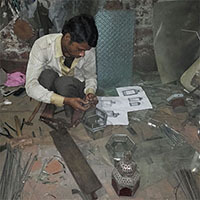 Moradabad Artisans are worldwide renowned for their Art and have their own identity. 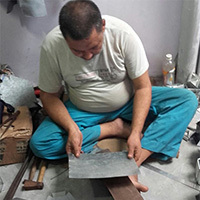 Our Artisan partners are masters in their field as they are the 3rd generation of their families who was involved in making the handmade crafts. We are introducing & promoting our artisan’s handmade work & spreading their Art, so that they would earn better and can secure the future of their families, who are living below poverty line and struggling to earn the livelihood. They make wonderful Craft and did not get the money of their hard work because they might not know the value of their Art. We are trying to improve the living standard of our artisan community and focusing to improve their child’s education & health. Master Piece Crafts Artisan Community has 1000 artisan members. Our Community has both Men & Women Artisans and are working in their areas with responsibility and credibility. 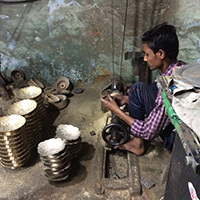 Our Artisans are making products like Jewelry, Lanterns, Tea Light Holders, Candle Holders, Vases, Bowls, Tray, Glasses & other Kitchen items etc. using Brass, Copper and Iron.